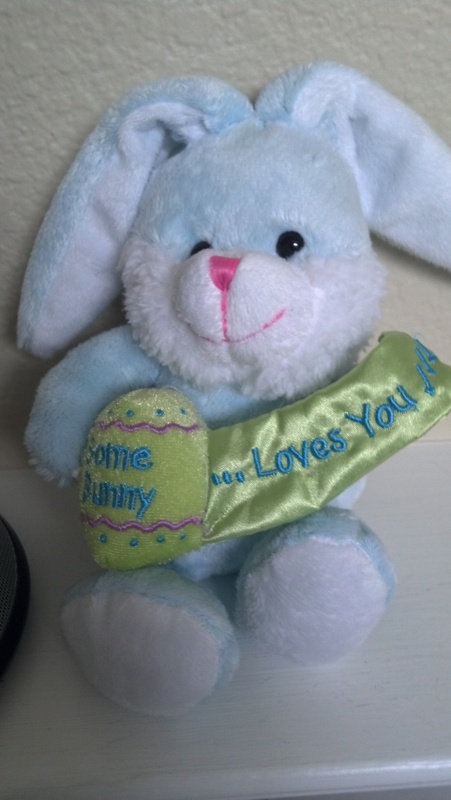 I’m not sure how it started but every year I ask the “Easter Bunny” for a blue bunny. And that darn bunny always delivers. Not always a blue bunny, maybe a beanie baby bunny or a polka-dot bunny, but always a bunny. This year, I forgot to ask and the Easter Bunny delivered anyway. This little guy was hanging out on the front porch when I got home from the grocery. It was exactly what I needed brighten my sick day. I love the Easter Bunny! 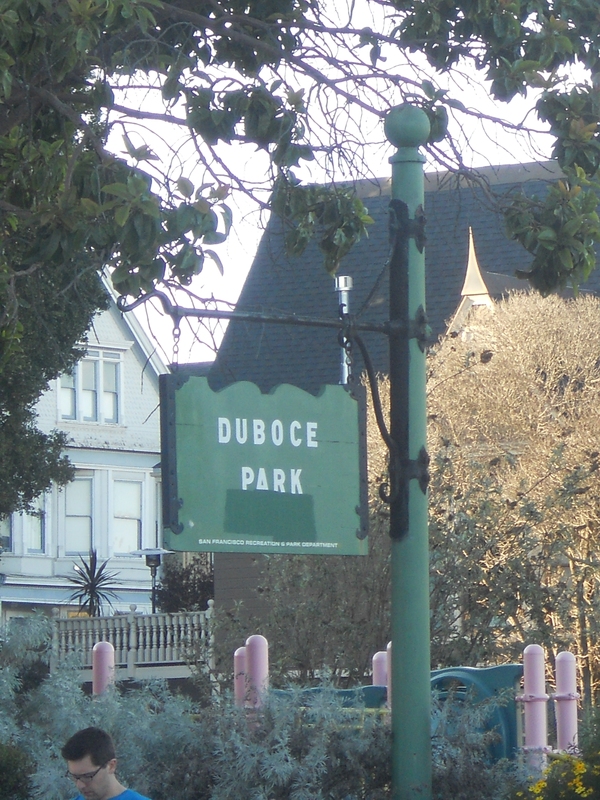 My day started by taking the BART to Duboce Park. It was a B-E-A-utiful day in the park. I could have stayed here all day! Does this scene look familiar? 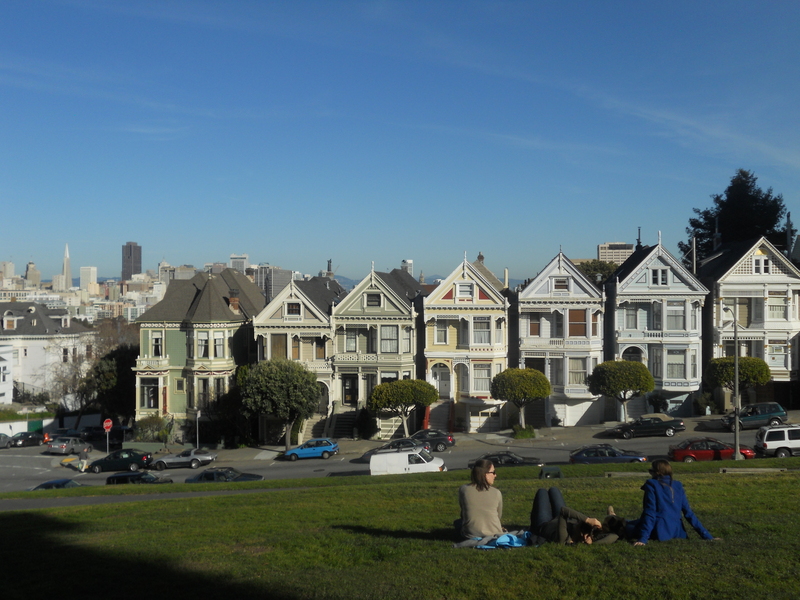 This is where DJ, Stephanie and Michelle had a picnic with Danny, Uncle Jesse and Joey. 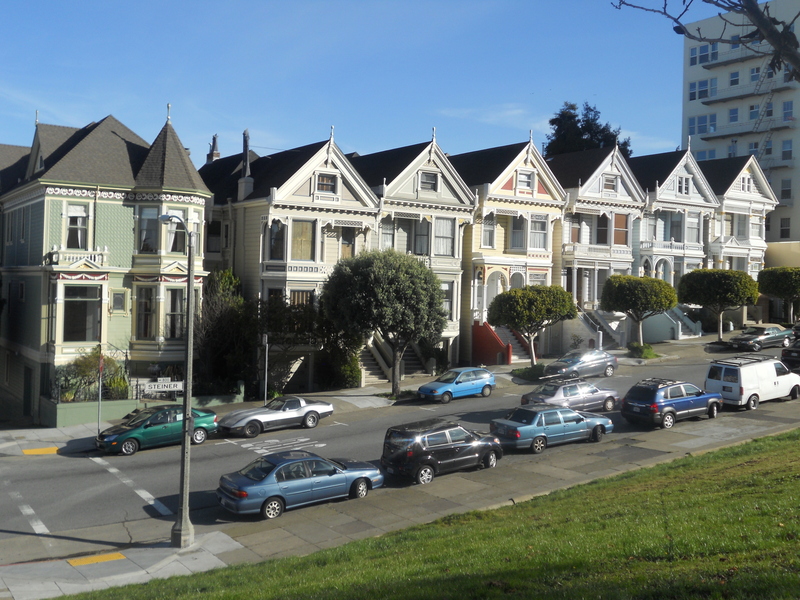 Or it’s Alamo Square just across the street from the Painted Ladies. Hello pretty ladies, beautiful day! Again, I could have stayed here all day! But I had other things to do. 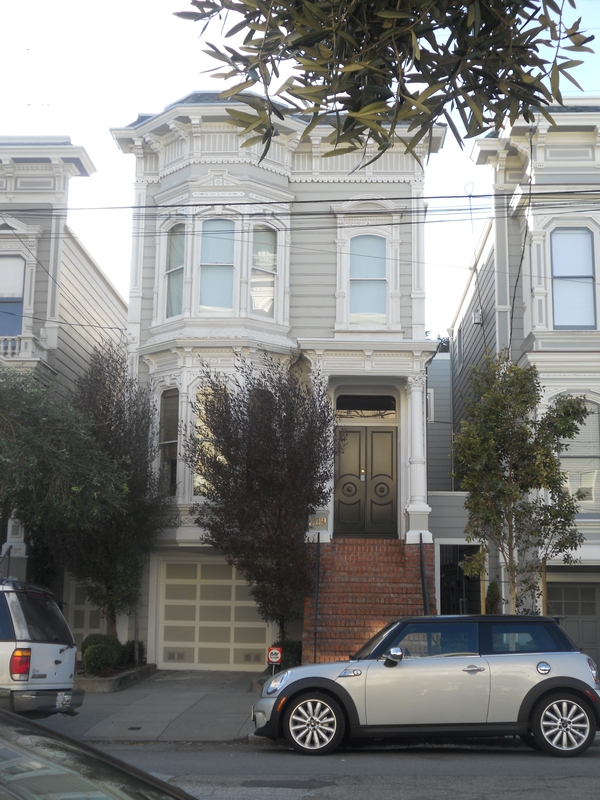 Like find the real Full House house. 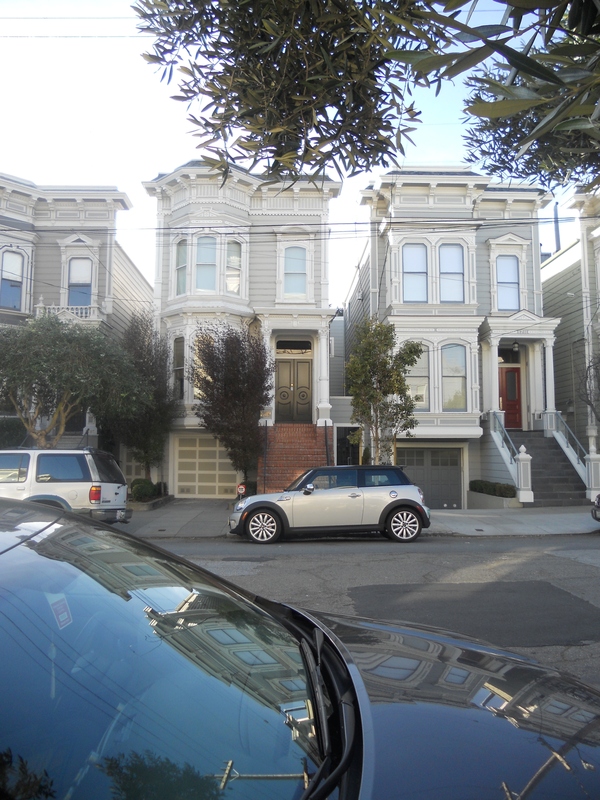 And this is it – 1709 Broderick Street. Another shot. And yes, two people drove up to this home for photographs while I was there! In hindsight, the route was definitely a tourist mistake. 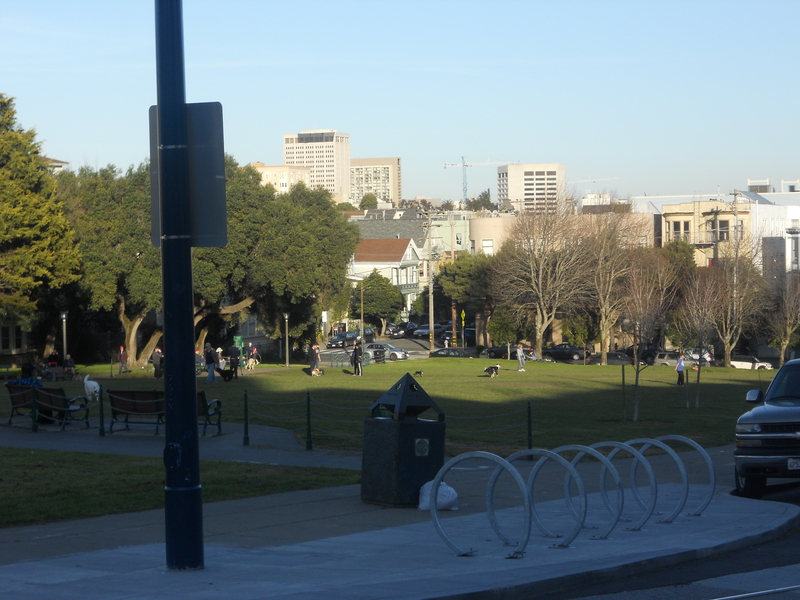 It’s fair to say that Alamo Park and the Full House house is at least 2 miles apart. 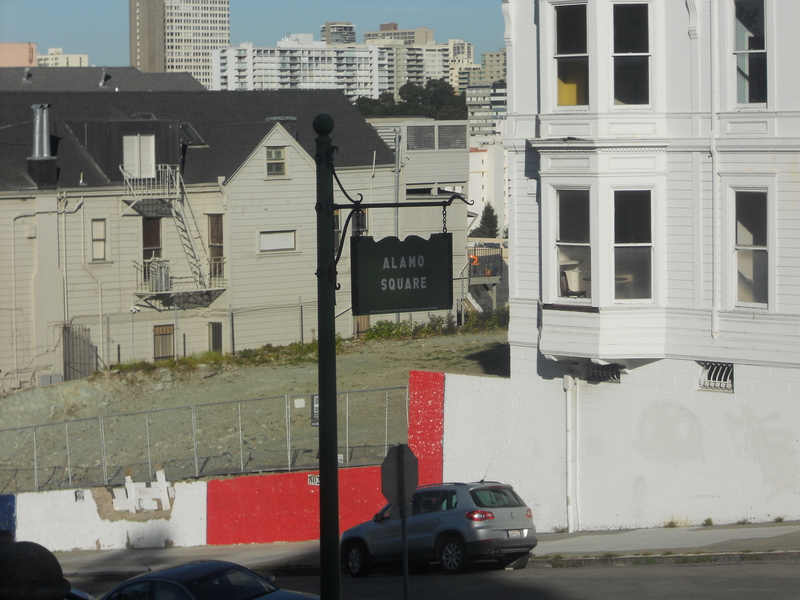 And I walked the entire way….up and down the wonderful, not-flat streets of the city. I think I totaled 5 miles that day! There are many differences between life in Cali and life in Indiana. California has much more sun than Indiana. People in California wear winter coats when it’s 50 degrees. It’s currently snowing in Indiana, expecting 6-10 inches, and I have my windows open. But nothing compares to the shock I have experienced this week. Bracketology? March Madness? Is anyone out there? Is this thing on? Not everyone in California is unaware of the huge 68-team tournament going on. There were two gentlemen at work who had teams (St. Mary and Oregon) that they were following. My friends Amber and Greg filled out brackets. Other than that, nothing. Let me share with you a few examples to illustrate the lack of excitement. Employee 1: Well, looks like St. Mary lost. Employee 2: Why is the game on now? Why isn’t it on tonight so you can watch? Employee 1: It’s the tournament. There are games all day. Employee 2: Games all day? How big is this tournament? Employee 1: I’m not sure but games are all day today and tomorrow. Employee 2: Oh my goodness….that’s unbelievable. Appleebee’s had 7 television screens in the bar. Two were turned off, two had poker, two had golf and the final had some talk show. I was very homesick on Thursday and Friday. Seeing Facebook posts from my friends….getting into cabs at 11 a.m. (love my responsible friends) or taking off early from work for brewski’s and basketball. In my youth, I would take that Thursday and Friday off, cab to the bar, and sit with my friends with my brackets (typically 2) and highlighters (because I’m just cool like that), watch basketball, drink beverages, eat horrific bar food and make new friends based on your “picks”. Cheering for the underdogs, booing the referees, doing your best Dickey V impression – just truly loving the atmosphere. I’m sure that if I would have used the term “bracket buster” in the office, someone would have thought we had broken a part! I realize now just how much March Madness is a Midwest pastime. It’s almost as if I live in another country. My brother asked me earlier today – “would you rather have March Madness and 10 inches of snow or the NCAA Tournament and 70 degree weather?” I chose the latter. And I can guarantee, there will be an office pool for the 2014 March Madness! I plan on bringing a bit of my Hoosier Hysteria to the great state of California! So, how’s your bracket? Gonzaga screw you too? This blog has been temporarily interrupted by…..
Hello. My name is Pam and I’m addicted to Candy Crush Saga. We’ll resume regular blogging soon. (Maybe) And I maybe posted this from my phone waiting the allotted time period for another life.